For the next two weeks, the zodiacal light will be visible after twilight ends in the western sky. This sky map made with Starry Night Software shows where it can be seen from dark-sky locations. What is the faintest thing you can see in the night sky with your naked eye? For many city dwellers, seeing even a handful of the brightest stars in the sky may be a challenge because of widespread light pollution. We light our cities brightly at night, dimming even the brightest stars. Yet there is something even fainter that you can see, without any optical aid, under truly pristine skies: the zodiacal light. So what exactly is the zodiacal light? Most people, even experienced stargazers, have never seen the zodiacal light. In fact, most people in the 21st century have never seen the Milky Way, which is far brighter. Although the zodiacal light is visible from dark sky sites on any dark moonless light, you can improve your chances by looking at the right time and date. The next two weeks are about the best time this year for observers in the Northern Hemisphere, because the ecliptic is at a very steep angle to the horizon at this time of year. The moon has moved into the morning sky, leaving evening skies dark. It's important to wait until your sky is completely dark. This happens when the sun is at least 18 degrees below the horizon. This means that you will need to wait at least an hour and a half after sunset. But don't wait too late. The zodiacal light moves across the sky with the sun, so it will be setting too. Looking west an hour and a half after sunset, you will see the Milky Way arching across the sky, marked by the bright stars Rigel, Betelgeuse, and Capella. 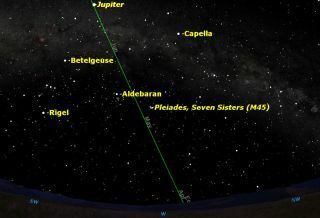 The ecliptic rises almost vertically from the western horizon, marked by the Pleiades, Aldebaran, and Jupiter high in the sky. Once you can see the faint glow of the Milky Way, look below it for an even fainter glow rising upwards from the horizon. You may need to use an astronomer's trick here: averted vision. The part of the human eye most sensitive to faint light is not in the center of our visual field, but slightly off to the side. So often you can see things that are very faint by not looking directly at them, but rather slightly off to the side. When you actually see the zodiacal light in the night sky, you will see it as a broad cone of light, broader at the horizon and tapering towards the zenith. You will be seeing the combined glow of sunlight reflecting from millions of tiny particles, each and every one of them in their own orbit around the sun. The dust between the planets, that scatters sunlight our way, is not from the asteroid belt (depicted here in green), but from periodically disrupting comets that spend much of their time near the orbit of Jupiter. As the Earth moves in its orbit around the sun, it moves through this cloud of interplanetary dust, and we see the individual impacts of these dust particles with our atmosphere as meteors, or "falling stars." The zodiacal light is brighter towards the sun, because the particles concentrate in that direction, and are closer to the sun. But there is also a brighter spot directly opposite the sun in the sky. This is called the gegenschein or counter-glow. The interplanetary particles act like the letters on a highway sign, and reflect more strongly when directly opposite the source of light, in this case, the sun. Editor's note: If you snap a great photo of the zodiacal light and the Milky Way, or any other night sky view, and would like to share it with Space.com for a story or gallery please send comments and images to managing editor Tariq Malik at: spacephotos@space.com.